Foto/Scan - digitalmente renovado: (W.Griem, 2014); De: Carl Vogt (1866): Lehrbuch der Geologie und Petrefactenkunde. "Ammonites cordatus" Tomo 2, página 601, figura 1385. Dimensiones Originales de la figura: 5 cm x 3 cm. 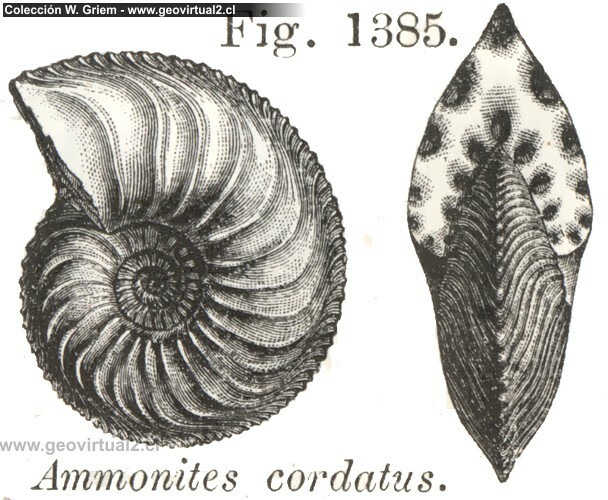 Carl Vogt publicó un Cardioceras cordatum bajo del nombre Ammonites cordatus. Pertenece al grupo de los Stephanocerates. Wright, J.K. (2012): Speciation in the cardioceratinid ammonites of the Costacardia Subzone (Cordatum Zone) of the Oxfordian of Skye. - Scottish Journal of Geology ;vol. 48(1), pág. 61-72.